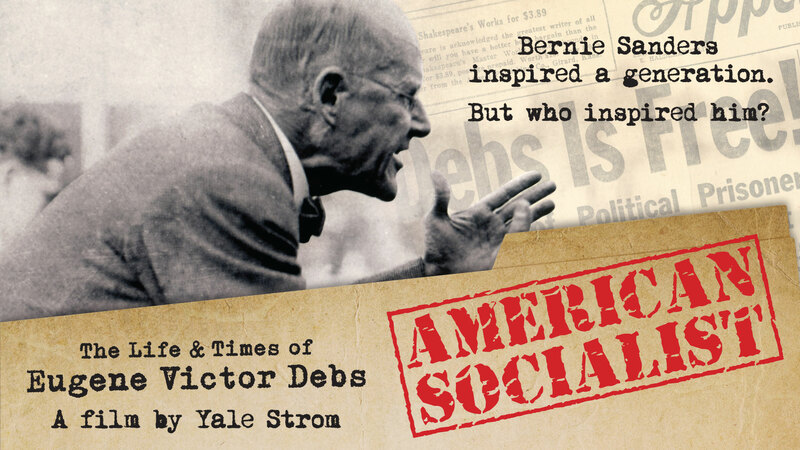 In my earliest days entering activism, Eugene Debs – the great American socialist – became my first hero, so when I heard about the Yale Strom’s movie American Socialist: The Life and Times of Eugene Victor Debs I knew I had to go. With Strom’s collection of photos and recordings of speeches, it’s easy to see why people flocked by the thousands to hear Debs speak. In fact, in 1912 a sold out crowd at Madison Square Garden gave Debs’ a 29 minute standing ovation after his speech. The timing could not be better for this movie as there is currently a resurgence in interest in socialist ideas. Pushed by the Bernie Sanders campaign in 2016, and now continued primarily in the explosive growth of the Democratic Socialists of America (DSA), looking back to the life of Eugene Debs is looking to the socialist heritage of the USA. The small New York City theater I went to would not receive the kind of attention Debs received in Madison Square Garden, only a handful of note-taking Debs’ fans attended, but it did leave me understanding this period of American socialism much better, and for anyone interested in Debs it should be a must see. We are given a close look at the many stages of Debs, and his political development; from a Democratic craft union leader to a union fighter who built the first mass industrial labor union to a five-time Socialist Party presidential candidate who was jailed multiple times for his beliefs, there are lessons to be learned throughout his life. Debs’ got his start in Terre Haute, Indiana, where he became a key figure as a labor leader of the railroad workers. But his politics at the start were far from the socialist ideas he later developed. In fact, the film correctly points out that Debs did not side with the workers in the 1877 railroad strike actions, where he suggested negotiating rather than going on strike. It was Deb’s key role in constructing the American Railroad Union (ARU), which organized all railroad workers into one union, and the subsequent Pullman strike, which shut down railroad across the Eastern United States which lead to Debs’ first stint in jail. It also inspired him to a take a socialist view of the world. Although Debs had previously never focused on theory, he spent his six months in jail immersing himself in Marxist literature. This was due, in part, to the many visitors, inspired by his work, discussing Marxism with him. The most notable of these was Victor Berger, who later helped Debs create the Socialist Party. The experience of the federal government smashing the Pullman strike shattered Deb’s belief that all workers had to do was organize into a bigger and stronger union in order to have a decent life. Debs was a tireless campaigner for the interests of the working class and as a Socialist Party organizer, travelled from city to city on a small train nicknamed the “Red Special” speaking to crowds of thousands about the evils of capitalism. The archival footage was really able to capture the energy and excitement of the crowds. Debs and the Socialist Party reached their height during the 1912 Presidential campaign, where Debs received nearly a million votes – 6% of the popular vote. This momentum played a huge role in getting a wave of Socialists elected all over the country. Unfortunately, this success wouldn’t be enough to overcome the obstacles created by World War I, where many socialists gave in to pressures and accepted the war, causing a giant rift in the party. Debs stood firmly against the war, so much so that he was once again sentenced to prison. It was from his prison cell that Debs made history by receiving just under a million votes for president in 1920. This film does a remarkable job of showing Debs’ effect on people. Not only do we learn of Debs’ character, but we travel back in time to see what life was like then. We’re given many cultural touch points that show us how well Debs ideas captured the imagination of people – such as references and quotes from popular figures such as poets, musicians, and religious leaders as well as workers themselves. In his folksy manner, he spoke the language of the country. When he spoke it was as a worker to workers, engaging them through their own experiences; he met the workers where their understanding was. This can be summed up in his famous statement “While there is a lower class, I am in it; and while there is a criminal element, I am of it; and while there is a soul in prison, I am not free.” This is one of the big reason people would pile in wherever he was speaking by the thousands. In another example, the film highlights Debs ability to capture the attention of Polish workers, despite the fact that they didn’t understand many of his words. Debs was sentenced to 10 years in prison. In poor health and isolated, as he was eventually moved to a maximum penitentiary where he could not read socialist literature or communicate with anyone outside, Debs as well as his loved ones struggled during this period. The film does a remarkable job of revealing the struggles of his family at this time too, something I had not considered nor seen before. We’re shown how much his parents, his wife Kate, and his brother, were devoted to his political work. It was from this jail cell that Debs, inmate 9653, received nearly one million votes for president (about 3.4% of the popular vote). Despite such a remarkable feat, Debs was still disappointed the turnout (by percentage of popular vote) was lower than his history 1912 campaign – due largely to the factions over the war creating a rift in the party. We study Debs today not just for his story, but because the lessons learned during his life remain relevant. Unfortunately, this film fails to acknowledge some of Debs’ mistakes, particularly during the rift in the Socialist Party created by members taking a nationalist view and supporting WWI. While Debs was very vocal about his opposition to the war, he refused to take a leadership role in confronting those supporting the war, and so he withdrew from party disputes. Debs could have used his influence, as the most popular person in the party, to fight for his ideas, but he believed an all-inclusive party was more important than fighting for his positions and ideas. In 1956 James Cannon wrote “The Debs Centennial” where he referred to Debs’ inaction and unwillingness to take a leading role in the party during the faction fight. He said “Debs’ mistaken theory of the party was one of the most costly mistakes a revolutionist ever made in the entire history of the American movement.” As the most influential Socialist Party member of his day, he could have played a huge role in turning the Socialist Party to oppose WWI, which would have given an organizational strength to the antiwar sentiment that did exist. We owe so much to Debs for his work, and this film really conveys this. However, as socialists we must be critical of even our most inspirational leaders to learn the lessons of history so we may be armed for current and future struggles. It is to all those who suffer under this rotten capitalist system that we owe this. Who Would Debs be Today? This film is hugely successful at revealing who Debs was, but even takes it a step further. Throughout the movie we see flashpoints of movements in other times. For example, when pointing out Debs’ commitment to liberating black workers the film cuts to clips of Dr. Martin Luther King, Jr. The end of the film shows a collage of modern movements such as Occupy and Black Lives Matter, which serve as a reminder that the horrors of the capitalist system Debs was fighting still exist today. Today’s political situation is ripe for the growth of socialism. Just this year there has been huge growth in socialist organizations, most notably DSA who has grown to over 20,000 members. With such a dramatic shift, Debs’ ideas, and the lessons we’ve learned from his leadership, can reach a whole new generation, even 92 years after his death. The film has been released on DVD and is available on Amazon.